The City of Benares, also called Varanassi or Kashi, is the most important of the seven holy cities of the Hindu religion and is probably one of the oldest cities on earth. It lies on the Ganges, is an important place of pilgrimage and, similar to Rome, is regarded as the "Eternal City". Benares contains numerous shrines and places of workship. 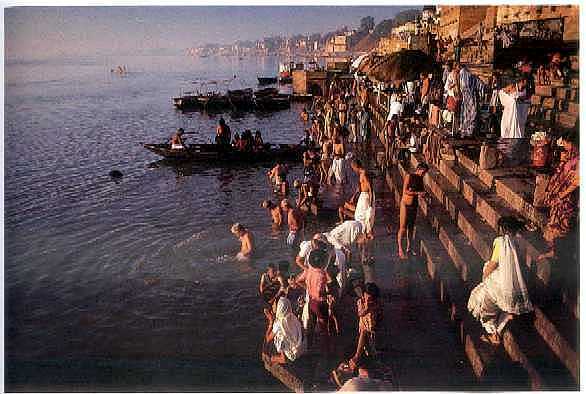 Pilgrims and devotees crowd the banks of the Ganges - a ritual bath in the holy river is said to purify the soul, conferring forgiveness and absolution on believers. The bathing sites, located at the feet of flights of steps called ghats, offer a fascinating insight into the religious life of the people. Here, in the spiritual center of traditional music and Hindu culture, the music of Benares is handed down from generation of the Mishra family. The melodies, which are hundred or even thousand of years old, are called ragas. The musicans have committed hundreds of such melodies to memory and offer them to their audiences as fits the mood and the occasion.